Apply a thin layer of Blackfriar Professional Graffiti Remover Gel with a brush or cloth to the affected area. Leave for 30 seconds and test a small area. If the graffiti is loose, wipe away with a clean dry cloth. If necessary allow to stand for a further 20 seconds. Turn cloth to a fresh face when contaminated. Immediately wash the cleaned surface with plenty of water after graffiti removal. If further cleaning is necessary allow the coating to recover for at least 24 hours to regain hardness. 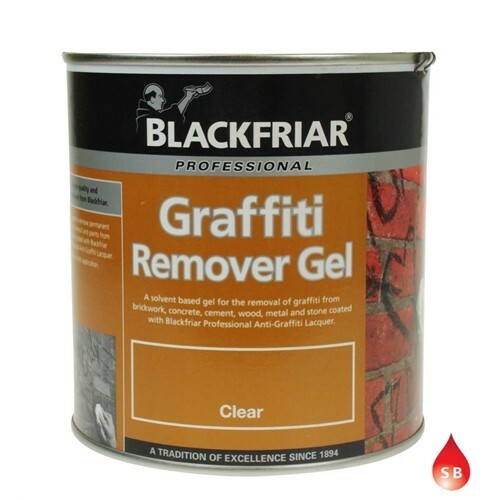 Do not leave in contact with Blackfriar Professional Anti Graffiti Lacquer for longer than 2 minute.